Suffers from: Polymicrogyria, a condition where the brain does not develop correctly before birth. Caleb cannot walk or talk as a result. 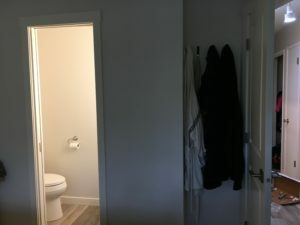 September 2018 – Our First Renovation Completed! We’re happy to say that our bathroom renovation for Caleb was completed in September! We gutted and enlarged the main bathroom in order to make it wheelchair-accessible. 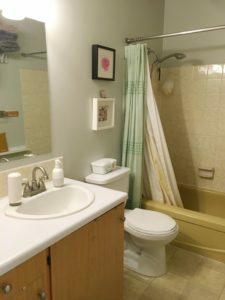 Instead of the previously-cramped 1970s-era room, we gave Caleb’s family a modern, spacious bathroom with accessibility features like grab bars. This will make showering a lot easier for Caleb and his parents. 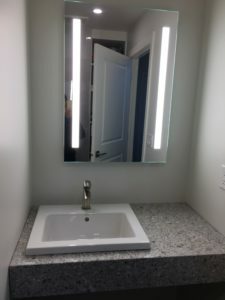 The main bathroom’s new counter, with sink and mirror. 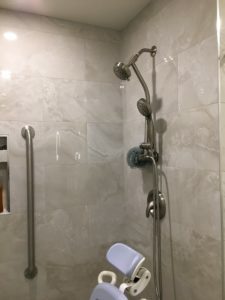 A closer look at the shower head and grab bar in Caleb’s main bathroom. In order to transform the bathroom, we also renovated the master en-suite, making it smaller. In the en-suite, we removed the walk-in closet, and in its place installed a notched-in area for closet hooks. Caleb’s en-suite pocket door and closet hooks. Our First Renovation – Meet Caleb! 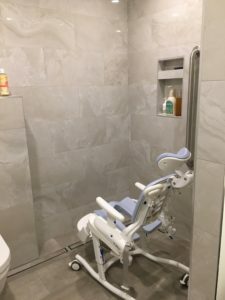 Our first accessibility renovation will be to give a full bathroom renovation for Caleb. Caleb is a happy and spirited 8-year-old boy born with polymicrogyria, a neurological disorder. Polymicrogyria is a neurological condition that happens when the brain does not develop correctly before birth. The brain has many little folds in it called gyri. However, people with polymicrogyria develop too many folds that are much smaller than normal. Sadly, this condition causes Caleb to have many seizures, and contributes to significant physical and mental developmental delays. For more information on this disorder, please see the U.S. National Library of Medicine website. Caleb and his adopted sister, Lily. Andy and Jay adopted Caleb at birth. 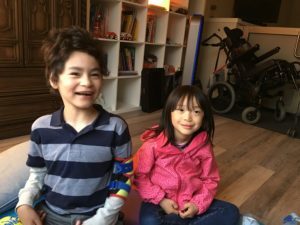 Both parents have worked hard to provide a loving home for both Caleb and his recently-adopted sister, Lily. 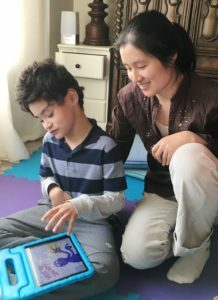 Lily also has had her challenges coming from China at 3 ½ years old and adjusting to a new life in Calgary. Once here, she also had to go through surgery to correct a severe cleft palate. While this is a lot for a toddler to deal with, she is thriving with the love and support of her parents and Caleb. Caleb with his adoptive mother, Jay. ARK is thrilled to be able to help Caleb and his family by providing a much-needed bathroom renovation. Now that Caleb is getting bigger and heavier to lift and carry, their typical ‘70’s bathroom makes every day very difficult. ARK will renovate the bathroom to make it fully accessible, with wheelchair access as well as a roll-in shower. Andy will no longer have to carry Caleb into the tub from his wheelchair in the hallway. Caleb’s bathroom from the 1970s. The estimated cost of this bathroom renovation is roughly $30,000. We hope to raise half of the cost through donations of labour and materials from our great supportive team of trades and suppliers. The balance will come through cash donations from generous donors such as yourself. 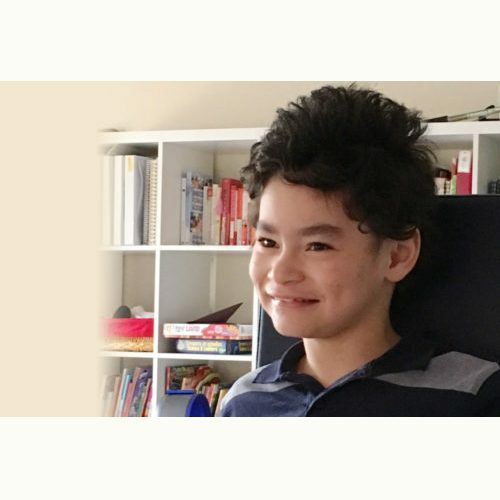 Get involved with our bathroom renovation for Caleb! get involved with ARK through one of our many volunteer opportunities. This way, you can help Caleb and other children in need! If you would like to help ARK help Caleb and his family, please do not hesitate to contact us. Your support would be greatly appreciated!